The protests, which polls show are backed by three quarters of the French public, reflect growing disillusion with Sarkozy's pledges of reform as the crisis has thrown tens of thousands out of work and left millions more worried about their jobs. Streets in central Paris were packed with protesters waving anti-Sarkozy placards and chanting slogans, with badges reading "Get lost you little jerk! ", the now infamous comment made by Sarkozy to a protestor at an agriculture show, much in evidence. "There are more and more workers who feel they are not responsible for this crisis but that they are the main victims of it," said Bernard Thibault, head of the CGT, one of the eight trade unions organising the strikes. More than 2 million people are out of work in France and despite an easing in inflation, even many with a job struggle with the high cost of living. Workers at the Continental tyre factory pelted managers with eggs at the protest this week and the government and business leaders have been acutely aware of the danger of unrest spilling over into the kind of violence seen in the urban riots of 2005. 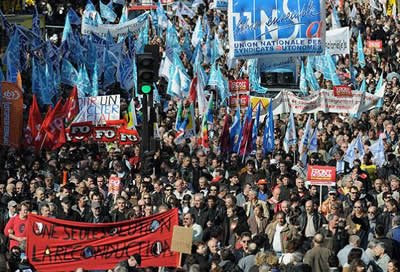 As many as three million people took to the streets across France today to protest against President Nicolas Sarkozy's handling of the economic crisis and demand more help for struggling workers. Bright spring sunshine helped the turnout and the total reported by union organisers surpassed the 2.5 million seen on an earlier day of protest on Jan. 29. A large public sector payroll and a relatively generous welfare state has kept French people better protected than many in other countries but there has been deep public anger at plant closures and stories of corporate excess. Sarkozy, elected in 2007 on a pledge to shake up the French economy, has seen his approval ratings plunge as he has poured billions into bailing out banks and carmakers but rejected union demands for higher pay and tax hikes for the rich. "People are in the streets and they are suffering, there are more and more people out of work and something has to be done," said Sylvie Daenenck, marching in Paris. "We shouldn't just be giving money to the bosses." The CGT said 3 million people had joined the protests, with hundreds of thousands at the main rally in Paris and tens of thousands taking part in marches in provincial towns and cities. Police, however, put the Paris total at just 85,000. Sarkozy's room for manoeuvre has been limited by the dire state of French public finances, which have been drastically strained by the need to prop up the fragile financial sector. But a series of disputes, ranging from strikes by university staff to unruly protests by workers at a tyre plant in northern France, have underlined a worsening climate of discontent that the government fears could escalate. Transport, energy and some government offices were all affected and unions said there was also strong participation by workers from the private sector, although there was no general shutdown of the economy. Most businesses and public services functioned at close to normal levels. The unions have presented a long list of demands, including a boost for the lower salaried, more measures to protect employment, a tax hike for high earners and a halt to job cuts planned in the public sector. The government has introduced a 26 billion euro ($36 billion) stimulus plan aimed at business investment, and after the Jan. 29 strike Sarkozy offered 2.65 billion euros of additional aid to help vulnerable households weather the storm. But there is little prospect of an improvement in the situation, with many analysts predicting the economy will contract by 2 percent this year and unemployment will jump 25 percent to almost 10 percent.